The Harrogate, Knaresborough and Ripon bypasses are among more than 40 roads in the district which will be resurfaced over the next few months. More than 70 miles of road, including residential roads and main commuter routes, will be surface dressed in the Harrogate District from Friday, April 20. The work is part of North Yorkshire County Counci's annual programme of road repairs and maintenance from April to October. 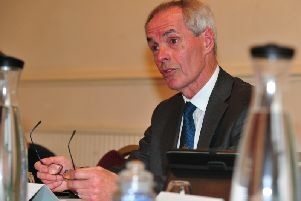 But NYCC's Executive Member for Highways, Councillor Don Mackenzie admitted that the surface dressing can initially be unpopular with drivers, mainly because the loose chippings mean a 20mph speed limit must be imposed. He said: "Surface dressing is comparatively low-cost at a fifth of the price of resurfacing. This means we can treat a much larger proportion of the road network each year, preventing the need for much more expensive work later. “We know the process is unpopular with some drivers, mainly because of loose chippings, but the speed of the operation and its long-term benefits, as well as the short time for which motorists are inconvenienced, are important factors. “It is important that traffic is allowed onto the new surface because chippings need traffic to fully push them into the road. "However, it is also important that drivers keep to the speed limit to allow the surface to stabilise and to avoid damage to their vehicles. Surface dressing involves spraying bitumen onto the road surface then covering it with a layer of chippings. After dressing, the new surface is left for seven days to allow the chippings to embed then any residual chippings can be swept up before road markings are repainted. The County Council claims the process can extend the life of a road by up to ten years but highlighted that surface dressing is in addition to the highway maintenance carried out daily throughout the county. The council said that in the Harrogate area, surface dressing works will be complemented later in the year by capital schemes, including the resurfacing of Skipton Road, Otley Road and Pennypot Lane. Information boards will be erected in the areas where work is to take place and letters will be delivered to affected properties. The work will be subject to weather conditions.